I currently work on computational analysis of mass spectrometry data as well as on coral health at the European Molecular Biology Laboratory, Heidelberg. This year, I'm participaring in Homeward Bound program. 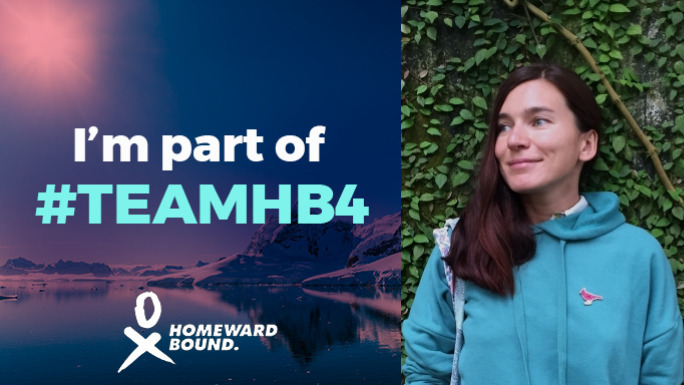 For more details, please check my blog and fundraising page, twitter @Katja_HB4. METASPACE. This project is on computational metabolite annotation of imaging mass spectrometry data. In this project, I work on applying natural language processing and computer vision algorithm to metabolite data. Photo Identification of Manta Ray Images. 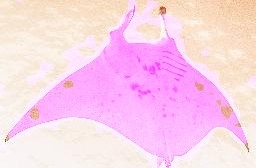 This project is on developing an algorithm and a desktop application for automatic identification of manta ray images. In collaboration with Mark Deakos from Hawaii Association for Marine Education & Research. Coral Health. This project is on analysing coral disease based on statistical analysis of the lesion distribution as well as on computer vision analysis of the coral colonies. In colloboration with UH Hilo Hawaii. 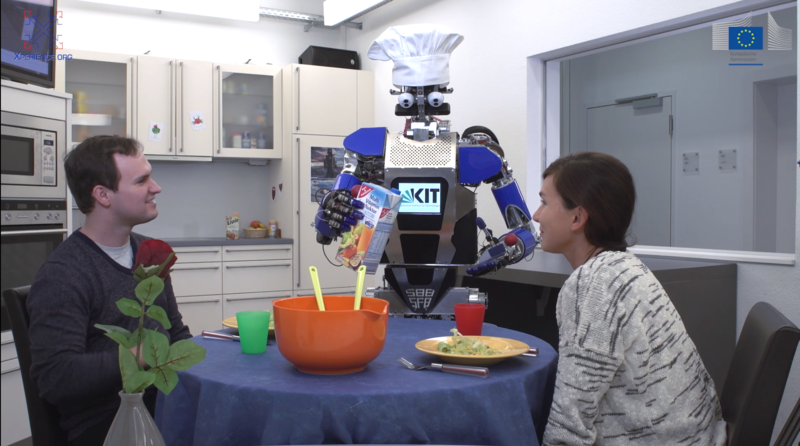 XPERIENCE: Robots Bootstrapped through Learning from Experience. The goal of the project was to extend state‐of‐the‐art enactive systems by using structural bootstrapping to generate new knowledge. Xperience implements, adapts, and extends a complete robot system for automating introspective, predictive, and interactive understanding of actions and dynamic situations. In this project, I worked on a dialog system, planning, and domain-specific knowledge extraction from corpora. 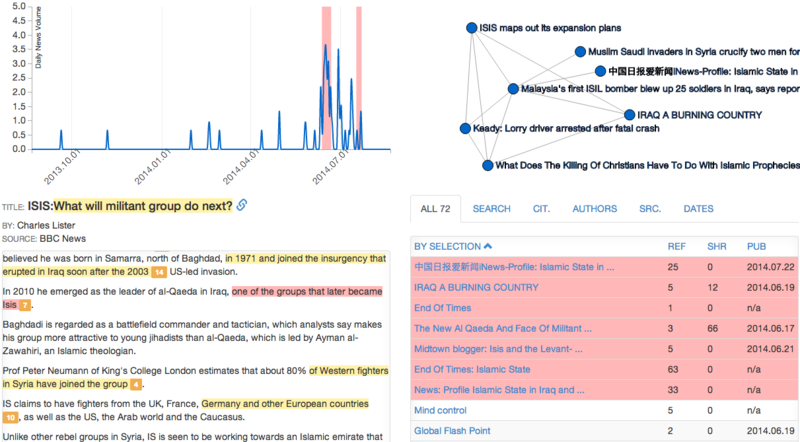 Mediator: Computational Analysis of Mass Media. This was a pilot study project on computational analysis of mass media. Our long-term goals were to develop tools for 1) tracking distribution of media content, i.e. looking for information sources, citations, and modifications, 2) finding contradicting and supporting evidence for news statements, 3) detecting media bias, 4) detecting manufactured spread of opinions. Photo Identification of Whales. This project is on developing a web service for uploading and annotating photographs of whales, matching new images against the accumulated whale catalogue, acquiring statistics about whale migration paths and population distributions. 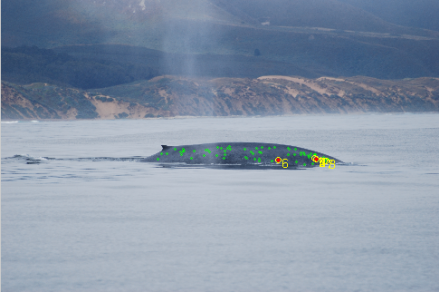 The main algorithm for automatic matching of whale images can be found in this repository. 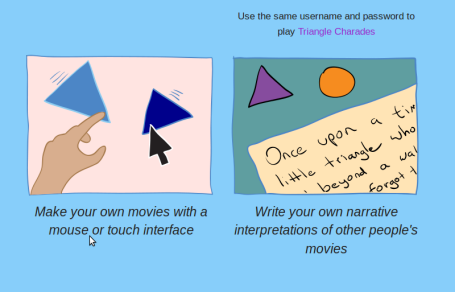 Heider-Simmel Interactive Theater (USC/ISI, USA). This project was on interpretation and narrativization of simple two-dimensional videos in terms of goals, plans, beliefs, and emotions. In this project, I worked on application of probabilistic abduction to scene recognition. Metaphor Interpretation for Cultural Schemas (USC/ISI, USA). This project is on detecting linguistic metaphors in English, Spanish, Russian, and Farsi texts, and mapping them to conceptual metaphors. I supervised a group (6 people) responsible for development of an abduction-based metaphor interpretation pipeline [Code] and corpus-based knowledge extraction [Web interface]. Machine Reading (USC/ISI, USA). This project is on acquiring knowledge by machine reading. I worked on turning lexical-semantic databases like WordNet and FrameNet into machine-readable FOL axioms applicable for reasoning. Adaptive Ontologies on extreme Markup Structures (University of Tübingen, Germany). 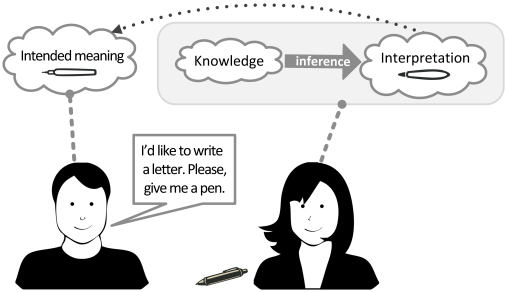 This project is on automatic extraction of ontological knowledge from text and updating existing knowledge bases. I developed algorithms for non-monotonic ontology updates including automatic resolution of ontological inconsistencies. Distributional Idiosyncrasies (SFB 441 at the University of Tübingen, Germany). This project is on studying how syntactic, semantic, and selectional properties constraint lexical elements in their contexts of use. I worked on developing a similarity measure for comparing grammatical structures and on implementing a web service for psycholinguistic experiments. Grammar Formalisms and Parsing (Department of Linguistics, University of Tübingen, Germany). This project is on developing an online course for teaching grammar formalisms and parsing. I developed the MoMo graphical tool for visualizing formal grammars (MoMo can be found here). Ovchinnikova, E. (2012). 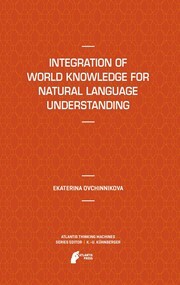 Integration of World Knowledge for Natural Language Understanding, Atlantis Press, Springer. Zock, M., Wandmacher, T. and Ovchinnikova, E. (2010) Are vector-based approaches a feasible solution to the "tip-of-the-tongue" problem? In eLexicography in the 21st century: New challenges, new applications, vol. 7, pp. 355-365. Krumnack, U., Ovchinnikova, E. and Wandmacher, T. (2007). 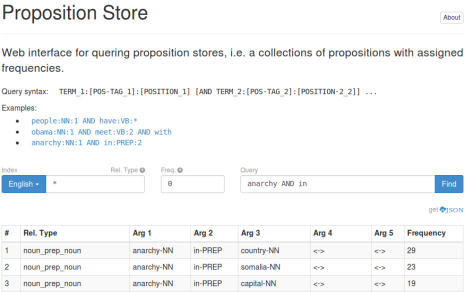 LexO: Constructing a lexical ontology from heterogenous resources. In Proceedings of the OntoLex 2007 Workshop. Kühnberger, K.-U., Wandmacher T., Schwering, A., Ovchinnikova, E., Krumnack, U., Gust, H. & Geibel, P. (2007): I-Cog: A Computational Framework for Integrated Cognition of Higher Cognitive Abilities, in Proceedings of 6th Mexican International Conference on Artificial Intelligence (MICAI 2007), LNAI 4827, pp. 203-214, Springer. Kühnberger, K.-U., Wandmacher, T., Ovchinnikova, E., Krumnack, U., Gust, H. & Geibel, P. (2007): Modeling Human-Level Intelligence by Integrated Cognition in a Hybrid Architecture, in P. Hitzler, T. Roth-Berghofer, S. Rudolph: Foundations of Artificial Intelligence (FAInt-07), Workshop at KI 2007, CEUR-WS, vol. 277, pp. 1-15. Mönnich, U., Michaelis, J., Ovchinnikova, E., Wandmacher, T. & Kühnberger, K.-U. (2007). 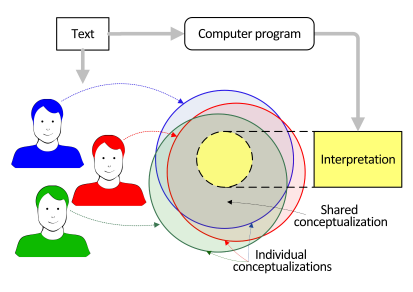 Information Extraction from Annotation Graphs Serving for the Adaptation of Ontologies - Position Paper. In Proceedings of the Workshop "Learning from Non-Vectorial Data" (LNVD 2007) held in conjunction with KI 2007, Osnabrück. Ovchinnikova, E. and Kühnberger, K.-U. (2007). Automatic Ontology Extension: Resolving Inconsistencies - Extended Abstract -. In: Proceedings "Ontologies and Text Technology: Approaches to Extract Semantic Knowledge from Syntactic Information", PICS, vol. 2007-1, pp. 93-98. Azarova, I., Ivanov, V. and Ovchinnikova, E. (2005): Semantic Structure of the Proposition in the Procedure Extracting Facts from Russian Texts. In: Koboseva, Nariniani, Selegea (eds): Computer linguistics and intellectual technologies. Proceedings of the international conference Dialog'2005 (in Russian). pp. 6-11.